The BLT Salad really has everything in a BLT, only in salad form. So less guilt, I hope? Or maybe not! You be the judge. Big bonus points that Bacon Lettuce Tomato Salad is super easy, hardly takes any longer than making the bacon, and travels well. It’s the perfect summer party salad or it can be served as a main dish or a side salad at home. The Bacon Lettuce Tomato Salad is surprisingly delish. It’s like I can’t stop eating this delish. It’s creamy, cool, sweet & tangy chewy crunchy deliciousness. I mean, bacon, of course, you can’t go wrong! But then there’s a ton of tomatoes, any kind you want, really. It would be great with one of those packages of multi-colored babies. But the croutons just steal the show! They’re crunchy deliciousness and seriously good with the dressing. I fell in love with this sweet & tangy and very basic mayo-based dressing. Trust me on this – it just sets this salad off to a T. It’s kind of like magic. Best of all, the dressing is three ingredients – the Mayo and equal parts vinegar and sugar. My Grandma used to make something like it and usually this German-based dressing is made with cream, half & half or even milk or buttermilk and sometimes I see it on cucumbers made with sour cream. I wanted the taste and body of the mayo, though, coz BLT! I had a little angst about the Mayo. See, I know there are haters out there! People, you know who you are! I got your back. If you’re not so much a mayo lover (or maybe you can’t have eggs?) make the dressing with sour cream or yogurt, instead and thin it out a bit more with water. Or maybe you’ll want to go in a whole different direction and make this Balsamic Bacon Vinaigrette. Then your salad will be more like a Panzanella. Which can never be wrong! When I thought about how I was going to make the Bacon Lettuce Tomato Salad, I basically just deconstructed the sandwich. I figured two pieces of bacon per person, just because I wanted lots and lots of bacon goodness. It was the perfect amount, indulgent but not too over the top. Make it easy on yourself and make Buffet Style Oven Baked Bacon. Then I wanted lots of tomatoes, so there would be two full servings per person of veggies between the lettuce and the tomatoes. I sliced those tomatoes by putting them in a yogurt lid and topping them with another and running a knife through horizontally between the two lids. I wanted them sliced so the juices would mingle with the crunchy, chewy croutons. When it came to the bread, I figured I’d need at least one good-sized slice of ciabatta per person, but boy was I wrong. By the time I had made the bread and cut it into croutons, I realized I needed half of that. So use one-quarter of a loaf of ciabatta, sliced in half horizontally. I slathered it with a generous amount of olive oil on the cut side and grilled it but you can use the bacon drippings if you’re so bold. And if you can’t grill, just broil or brown in a skillet, cut side down. Bacon used to be so cheap but now you can pay more per pound than you do for steak! Since it takes up so little room, shop strategically and freeze. Watch the sales closely, especially around holidays when it is bound to drop to a big low. If you aren’t opposed to using the drippings, save them in a jar in the fridge. Those drippings can bring bacon flavor to dishes that need it without using the actual bacon. As far as the veggies, try to be flexible and buy what’s on sale. If you use whole tomatoes, deseed them as you cut. Lettuce is generally far cheaper if purchased loose. The packaged lettuces are literally 4 to 10 times the amount of buying by the head. The packages look like more than they are and are usually weighed in ounces, while the head lettuce is priced in pounds. That makes it pretty difficult to compare the two. The ciabatta was just the perfect bread for this salad, but any good, hearty, chewy bread will be wonderful. See what’s on special at the store bakery. Try to stay away from the light, fluffy “Italian” bread and stick with a baguette or artisan type bread. Keep in mind as you shop, what you’re going to do with the rest of the loaf since you’ll only need a quarter of it. If you’re a planner and don’t mind heating up the oven this Easy No Knead Artisan Bread is just the perfect texture and pennies to make. Make Croutons: Brush or drizzle the cut side of the ciabatta generously with olive oil or bacon drippings. Sprinkle generously with salt and pepper. Grill or place cut side down in skillet until the bread is golden and crunchy. May be placed under a broiler, instead. When cool enough to handle, cut into 1-inch squares. Add the lettuce to the bottom of the salad bowl. Top with the tomatoes, bacon, and croutons. Drizzle with dressing and toss. May be made ahead by about 1/2 an hour if tossed or longer if the dressing is added before serving. Mix all ingredients together except for the water. Taste and adjust seasonings. Add water by the tablespoon to get to a pourable consistency. 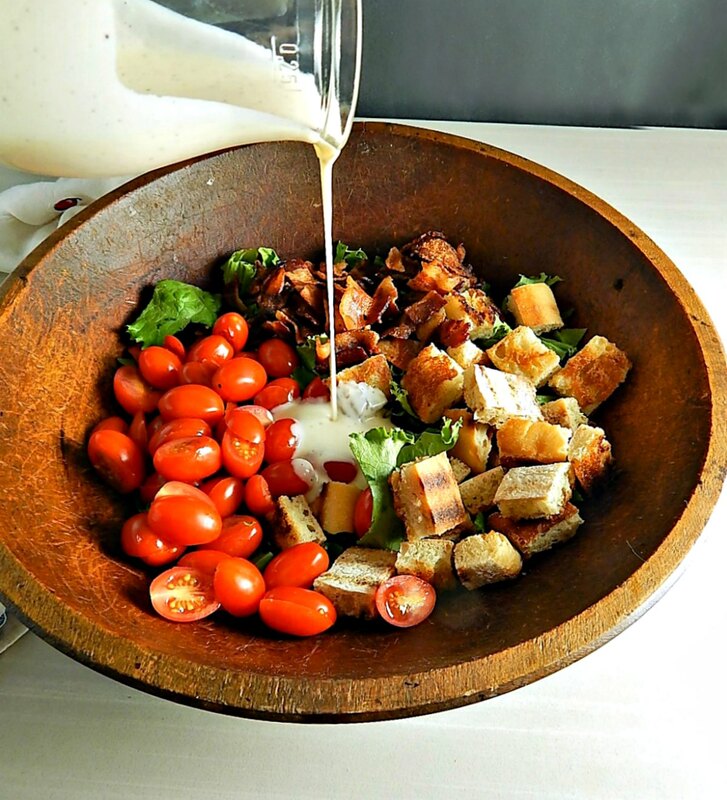 Dressing should not be too thick; it needs to be absorbed a bit by the croutons. Dress the salad generously; there may be a bit of dressing leftover. I’ll be bringing Bacon Lettuce Tomato Salad to Fiesta Friday #234, hosted this week by Jenny @ Apply To Face Blog and Deb @ Pantry Portfolio. Stop by and take a peek at their blogs! Jenny will have you in stitches (and good eats) and Deb’s enthusiasm for life and cooking is going to carry you away! This entry was posted in Click here for Fabulous Food Posts and tagged Bacon, Bread, German, leftover bread, Lettuce, Main dish salad, Mayonnaise, Salad, Salad Dressings, side salads, Tomatoes, Vinegar. Bookmark the permalink. Lovely little tomatoes in there Frau. Hi Sumith, and thanks so much! It went over very well and is bound to be repeated! This is great Mollie. This is an all time favourite for all ages! Beautiful share. I have a big pot, and maybe I should plant it. So far, 6 cherry tomatoes, lol!! But lots more to come! This salad is delish = it’s going to be made over and over, I think! This looks so good, what a great summer recipe! Thanks! Last winter was so long and cold, I’m determined to eke out as much life and fun and food as I can this summer! This sentence is the best — “It’s creamy, cool, sweet & tangy chewy crunchy deliciousness” and is making my mouth water! Thank you for sharing at #FiestaFriday! lol, well I wish I were always that inspired – but I loved this salad!! Thanks again for hosting for us at Fiesta Friday! They are so wonderful! I didn’t plant much this year, but I do have a big cherry tomato plant, but so far only three ripe tomatoes! But soon I’ll have a lot! Hi Sia, and thanks for stopping by! I’m glad you like it…it’s literally craveable!